This advertisement dates to 1963 and features a Maidenform 'Sweet Music' Bra. This ad intrigues me for a few reasons. First off, I love the pin-up style pose and the tag line, let alone her outfit consisting of high waist rolled up jeans, and a bandana at her waist. And that hat to go with silver flats. She's a woman on a mission. This is the inset diagram on the bottom of the ad. "SWEET MUSIC - with triangle inserts for extra uplift! The special triangle insert in each spoke-stitched cup emphasizes the uplift and gives you all-round firm, shapely support. Embroidered panels 'frame' each cup, defining your figure beautifully! Sweet Music can't cut of bind because the 'comfort band' beneath the cups is contoured and elasticized. No wonder Sweet Music is one of the most popular bras in the world!" And the fine prints. Did you know that Maidenform made swimwear? I've not been very successful at figuring out when they started manufacturing them, but this ad states swimsuits so I know at least that Maidenform manufactured swimwear in 1963 and possibly before. Ahhh, behold the beauty of master Claire McCardell. I never tire of looking at her work. 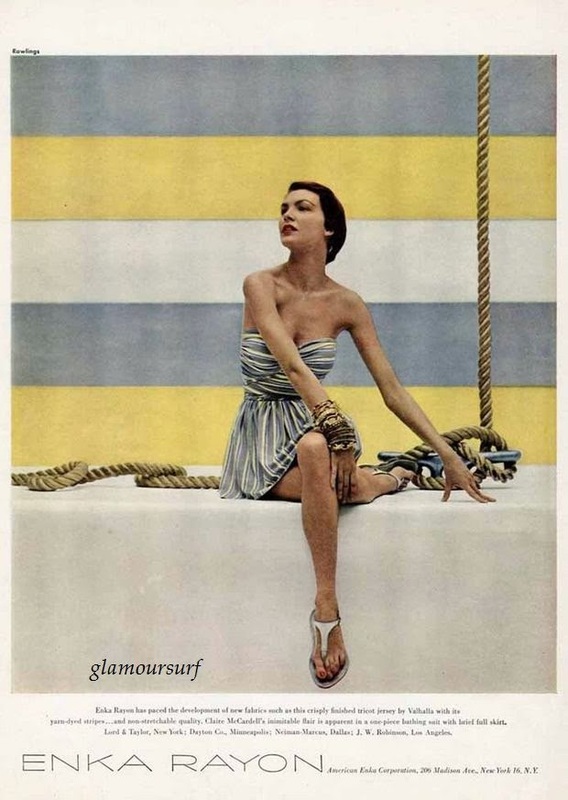 The vintage advertisement from the 1950s features one of her dressmaker swimsuits, butnote the styling of the photo. Her stripes match the background colors of Enka Rayon. That pose, those sandals, the stack of bracelets! Perfect! 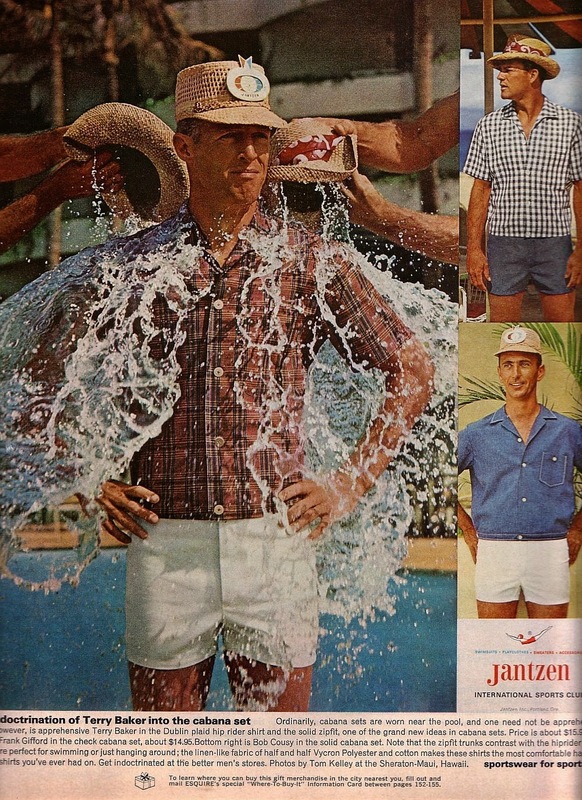 These are all part of the cabana sets, but called hip riders and zipfits by Jantzen. Sportswear for Sportsmen. Check out those hats and note the emblem of Jantzen on the front. The ad features sportsmen from the 1960s including, Terry Baker, Bob Cousy and Frank Gifford. 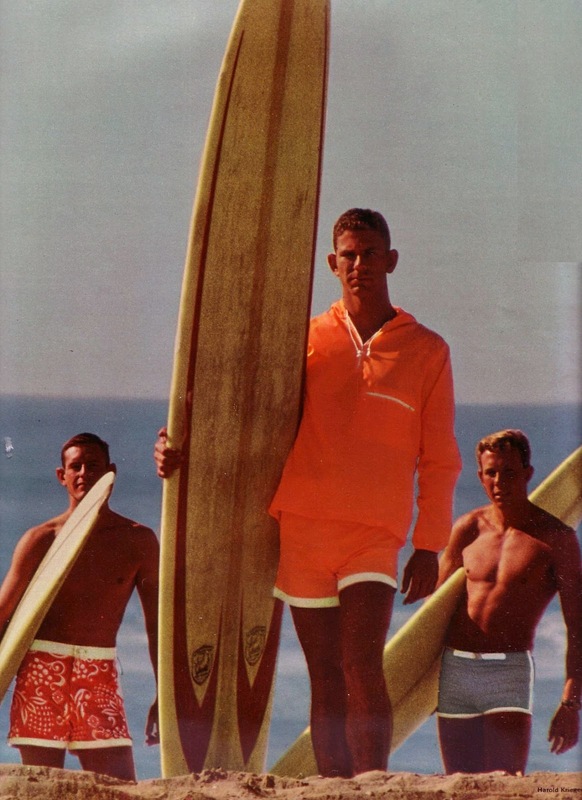 These images of handsome surfers and surf fashions are from 1964 and were originally published in Esquire magazine. The increasing popularity of surfing has encouraged a like trend in surfing fashions. Basic characteristics: loose leg, matched waist and leg band. 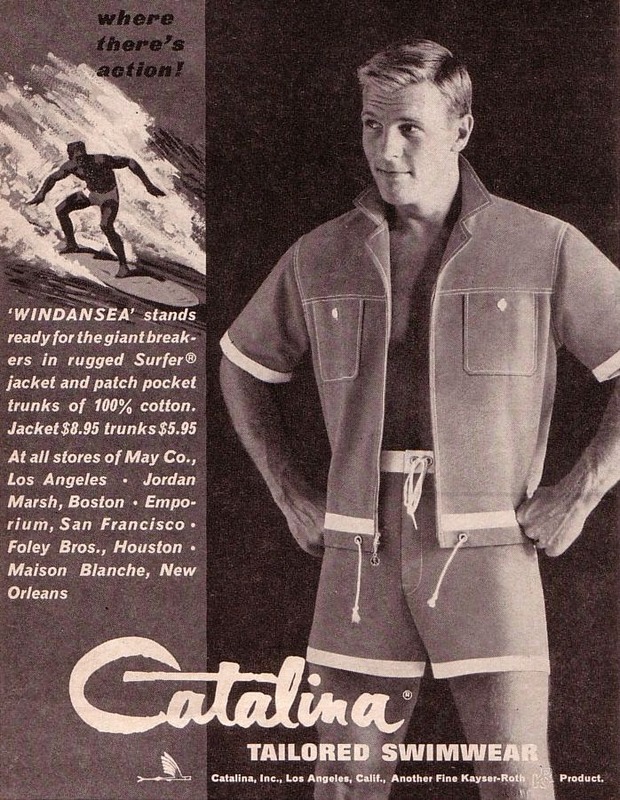 Upper left, surfer Bill Richardson wears a stretch Jantzen with a warm-up top. Walter Sawyer is shown in burgundy-blue and white- striped cotton ticking shorts, also by Jantzen. Photographed at the Huntington Beach Surf Club, California. 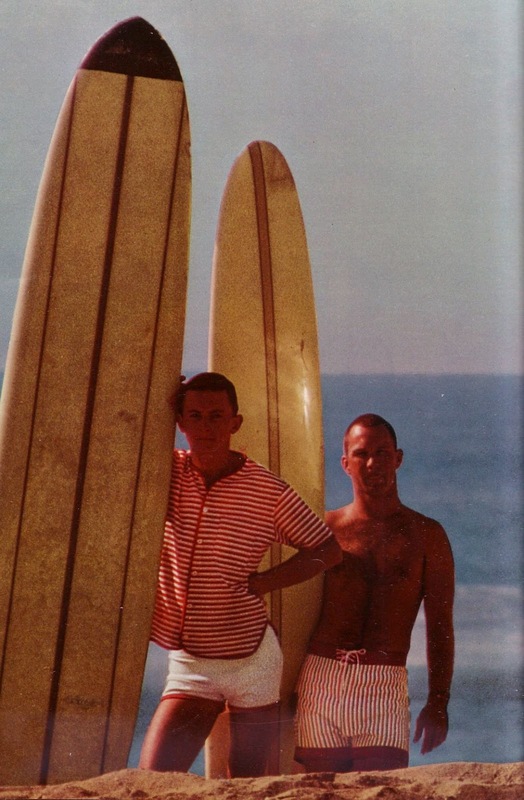 One of the most popular surfing styles is the bold red-and-white cotton print, left, by Catalina worn by Don Shusta. The shirt-shorts set, center is made of featherweight nylon by Catalina. The shirt is a parka style and is worn by Richard Scott. On the right Hap Cole wears a shorter version of the surfer in a grey lastex with white elastic side stripes. It's a stretch hip-rider,, also by Catalina.